Valderi Valdera: Twilight: Fanatics and Fangs. Minus the Fangs. Twilight: Fanatics and Fangs. Minus the Fangs. On Monday, I received an email from a desperate friend who, after seeing Twilight opening weekend, was already suffering serious Robert Pattinson-related withdrawal symptoms and the desperate need to see the film again ... 24 hours later. I wasn't actually planning on seeing the movie. Well, that's not true. I had decided if the Rottentomatoes critics rated the film very highly (> 70%), I would dish out the $12 to see it. And if the RT critics rated it very poorly, then I would see it - drunk. But with Twilight's middling 43% rating, solidly rotten, but not quite in the "so bad it's good" territory, I wasn't going to waste my time. And yet, I empathized with my friend's inner 12 year-old, and I was willing to suffer the film for her sake. I too had once obsessed over a tween-heartthrob (Leo DiCaprio, anyone? ), fanatically seeing Titanic in theaters 4 times before I was satiated. Of course, I was actually 12 at the time. Once again, low expectations paid off. Not only was I not disappointed, I was pleasantly surprised. I haven't read any of Stephenie Meyer's bestselling novels. 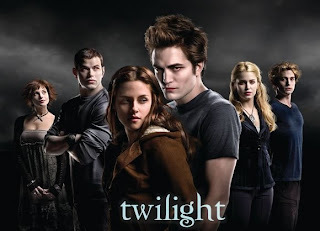 As a young adult/fantasy series aficionado, I'm embarrassed to say that I hadn't even heard of Twilight until Entertainment Weekly began writing a series of articles on the series and author this summer, around the time Breaking Dawn was published. I am not particularly fond of melodramatic romances, vampire stories, or bad writing, so I don't expect to enjoy the series, but I did buy a used paperback edition of Twilight at Strand last month. If I'm ever going to write for young adults, the least I can do is read what's already out there. "Better than it had to be" would be the six-word review. With a modest $37 million budget, a cast light on the A-listers, and with a target audience in the 12-17 year old range, it could have been a lot worse. Despite an uneven plot (jumpy in the climatic chase/final battle, while plodding in other parts), some of the scenes were downright stylish, including the vampires-playing-baseball bit, which, despite the inherent silliness, was actually a lot of fun to watch. I found Meyer's twists on the vampire archetype interesting. Along with their love of America's favorite past time and their clear lack of fangs, vampires also come in pairs (they're like together together), and they're super sparkly in the daylight. For me, the most unlikeable scenes were the same ones that had my friend's inner 12 year old swooning in her seat. As deliciously swoon-worthy 12 year old girls may find Bella + Edward, their "forbidden romance" is simply in no way up to par with Buffy and Angel's from Joss Whedon's Buffy the Vampire Slayer. While I thought Kristen Stewart did a fine job as Bella, Robert Pattinson, as Edward, was a disappointment. Pattinson's performance was very one-note; he could make broody faces, but he did little else. I wasn't convinced of his affection for Bella. Obsession, sure, but there was no real romance in his performance or his character's actions. Thanks in large part to Stewart's appropriately understated performance (up until the end when she really started to get whiny), the romance scenes were tolerable. Edward stared, Bella sighed wistfully, and that was that. I didn't buy that the two were destined for each other and I didn't buy that their "love" was anything more than a trumped-up, melodramatic high school infatuation, just one fantastical step away from disturbing, abusive, and controlling. When Buffy and Angel learn the hard way that their relationship is toxic (and doomed), as much as it breaks their hearts, they stay away from each other. Bella and Edward, self-absorbed and living-in-the-now, just don't have the maturity and self-respect to make that choice. And thus, their love story will always fall short. Edit: I just found this great article by Sarah Selltzer at the Huffington Post that sums up concerns about the undercurrents of the Bella + Edward relationship. man, your friend sounds like a loser! cuz um.. i would never do any of that.